I'm sorry to offend, but I just can't. I would never encourage my child, especially my SON to watch this "group". Is that what they are? Whatever they are, they freak me out. Maybe it's as simple as the outfits, or the colored faces, but I just can't do it. I pretty much squeezed by "The Wiggles"....I had minimal experience with them due to time and space between my kids, and I can do without them too, but at least their faces weren't blue, and green....with the wigs....I mean...I've toughed it out before. I've hung with Barney. LOTS of Barney. You know who else I toughed it out through, and I think was a terrible example for children because he was forever crying and whining? My least favorite thing in the whole world? Caillou. What a whining wimp. I have to admit that I have a secret love for Dragon Tales. Speaking of which I find it quite hysterical that Jennifer Lopez named her twins Max and Emme and those are the 2 names of the brother and sister on Dragon Tales. HeHeHe. AND if I'm not mistaken-Max and Emme on Dragon Tales are of Spanish heritage as well. That should have been on my "Things that make you go HHHmmm..." list. 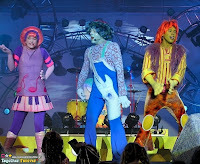 But anyway, yeah, I can't do the DoodleBops. Not that I have this issue because my son doesn't watch any television at all anyway. Sometimes that makes me HAPPY! And sometimes that makes me SAD. I'm sure you can decipher why.